The stone slabs leading up to Spaceship Earth look too much like a mausoleum for my taste. 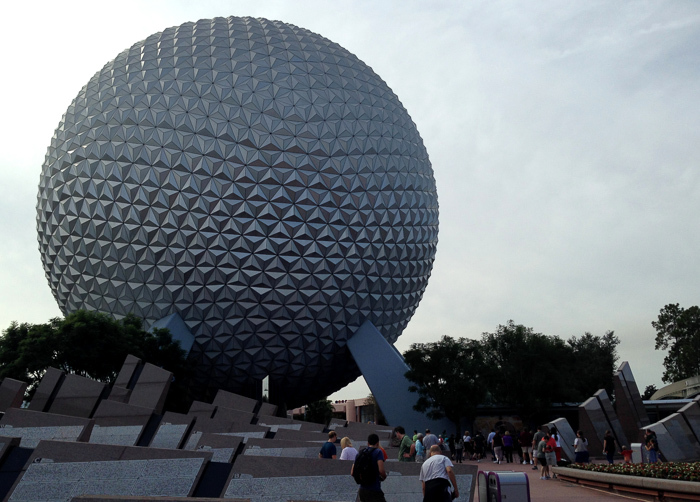 Epcot was still something of a mystery to us, and I woke up the morning of our third day eager to change that. Amy and I had vacationed at Walt Disney World twice before, in 2007 and 2009. These trips cultivated a burgeoning love for the amazing East Coast property, but were also barnstorming affairs. We had thundered right past masses of experiences in each of the four theme parks* on our way to the high-profile attractions. We also knew that these lesser luminaries – the things you “discover” – were the battleground. Either you found them, loved them, and it crystallized your fan heart forever, or you spent the rest of your life complaining about the price of ice cream bars and the line for Winnie the Pooh. There was no middle ground. Not for fans like us, anyway.